I have always thought that the traditional food for New Year’s Day was red beans and rice but apparently it is call Hoppin’ John and is served in the southern U.S. It is a porky, ricey, beany dish which is supposed to bring peace and prosperity. I guess that remains to be seen. Here’s our take on this iconic dish. First cut up a bunch of vegetables and sauté them. Then substitute ditalini for the rice and chickpeas for the beans. It is sort of all in the same family, right? Okay, there’s no meat but it is a good clean way to start out the New Year. 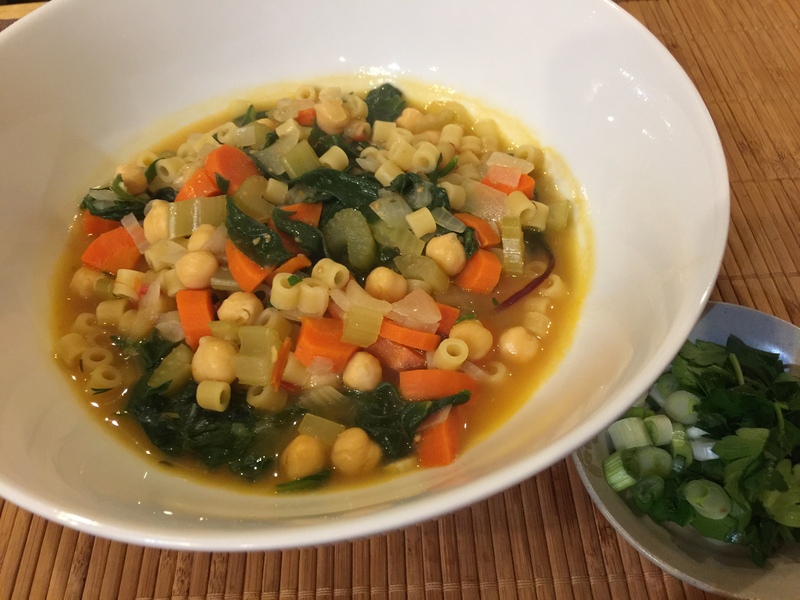 This entry was posted in Legumes, Pasta, Vegan, Vegetables, Vegetarian and tagged chickpeas, ditalini, Vegan, Vegetables, vegetarian. Bookmark the permalink.